A man believed to have rammed into police cars on two separate occasions has been arrested. 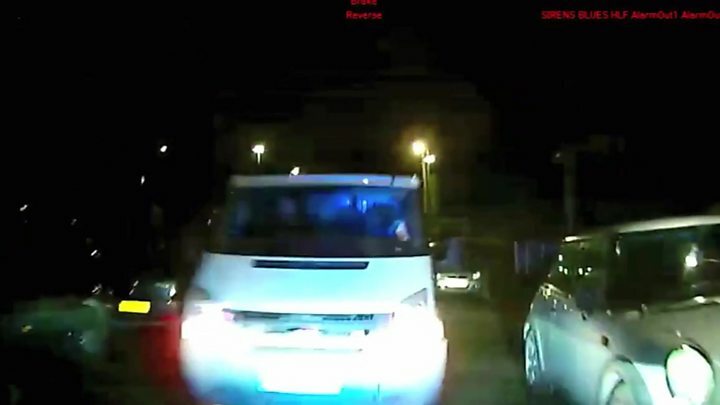 Two officers were hurt after a van they were pursuing turned around and drove at their patrol car in Salford on 5 September. Several police cars were rammed during another chase on Wednesday, Greater Manchester Police said. A 24-year-old has been arrested on suspicion of two counts of assault and two counts of dangerous driving. He is also being questioned for failing to stop for police, theft of a motor vehicle and criminal damage. A 21 year-old woman, who was arrested on suspicion of theft of a vehicle after the September incident, has been released under investigation. The injured officers were unable to continue their usual duties, the force said. Sgt Danny Kabal added: "The emotional and physical damage caused by attacks, no matter who you are, is something we will never tolerate and we will always do everything in our power to bring those responsible to justice."